Pápai Páriz Ferenc, Album amicorum p. 449. Emericus Pariz Pápai in Collegio Enyediensi Doctrinarum Studiosus Civis, Dulcissimo Fratri ad Partes exteras properanti hoc salutari Magni Verulami Praecepto memoriam sui altè impressam voluit. * Francis Bacon, Sermones Fideles sive Interiora Rerum, 1638, ch. 36. 2. The English translation is from The Essayes or Counsells, Civill and Morall, London 1597, ch. “Of Nature in Men”. 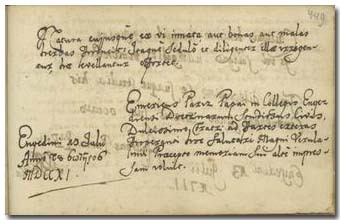 Imre Páriz Pápai, student citizen in the College of Nagyenyed, wants to greet his sweet brother who sets out to foreign countries, with the teaching of the great [Francis Bacon, Lord] Verulam, and to recommend his own memory deeply into his heart. In Nagyenyed, in the 1711th year of the Saviour, on July 13. Imre Pápai Páriz was born in Nagyenyed (Aiud) in 1693, the son of the renowned physician and professor Ferenc Pápai Páriz, Sen. (1649-1716) and of Judit Nyirő, grandson of the Reformed deacon Imre P. P. (1618-1667). He began his studies in the College of Nagyenyed. After the Austrian Imperial troops ravaged the town and the college both in 1704 and 1707, the professors and students fled to Szatmár (Satu Mare), then to Nagybánya (Baia Mare). They only could return in 1709. Imre Pápai Páriz immatriculated at the beginning of 1717 at the university of Leiden. From November 1719 he studied in Basel, and from 1722 in Zürich. In England he collected donations for the rebuilding of the college of Nagyenyed. At his return to home he was elected professor of the recently founded chair of philosophy of the college. He died in Nagyenyed in 1730. He wrote a laudatory poem at the beginning of the Latin dictionary of his father (1708), and published a funeral oration delivered at the funeral of Count József Teleki in 1729, as well as his dissertations of Leiden: Disputatio theologica de angelo faciei Jehovae ad Jes. LXIII. 9. … quam publice ventillandam proponit 12. Maji 1719. Lugduni Batavorum, 1719. – Disp. philosophica de vero via …, Leiden, 1719. Imre, the 18 years old student of Nagyenyed says farewell to his brother setting out to a long road with the words of Lord Verulam, Francis Bacon.